‪#‎musicmovesreza‬ @ RACE MATTERS! an exhibit at the URI Providence Campus that 1) celebrates Race and Cultural differences and; 2) addresses RACISM locally, nationally and globally. The exhibit runs January 25 to February 26, 2016, 80 Washington St, Providence; artist reception on Sunday February 7, 1-4pm. 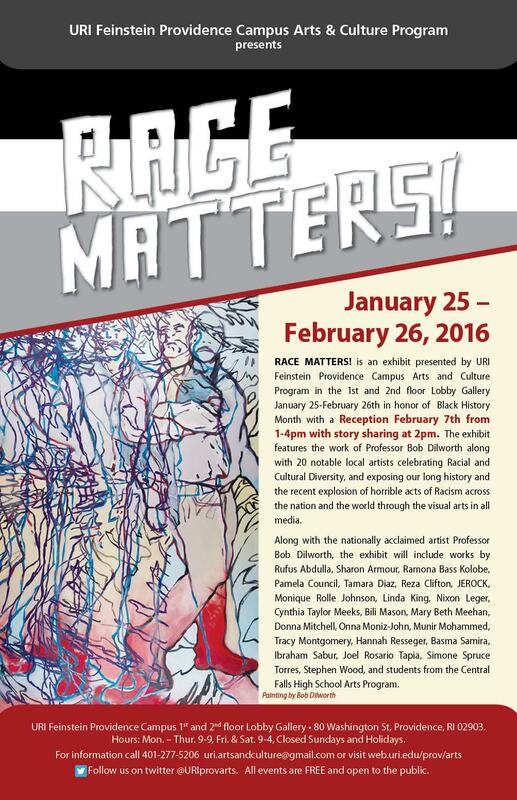 In addition to art from Reza Rites,‬ over a dozen other artists (20) have work on display in the Race Matters! show. In addition, directly following the reception on Feb 7 is a performance of “War Stories,” a performance art piece dedicated to Americans killed by racially motivated attacks. 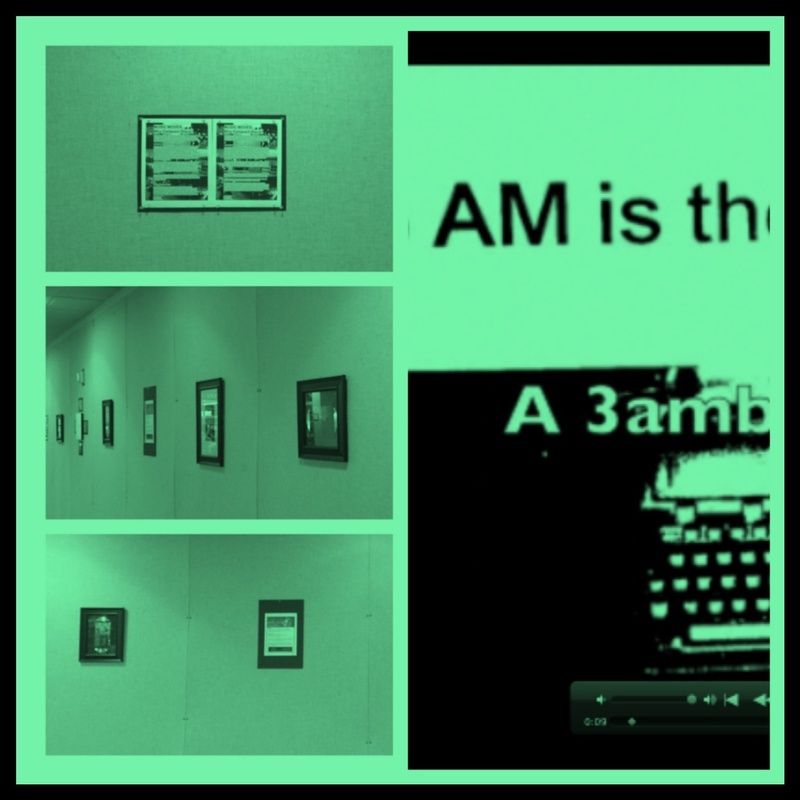 To read a press release about the intersections and linkages between the Gallery Director’s Race Matters themes and those of my Music Moves project, which are where my photos come from, click here. Click on on the first thumbnail image to the left to learn/read more about the Race Matters! 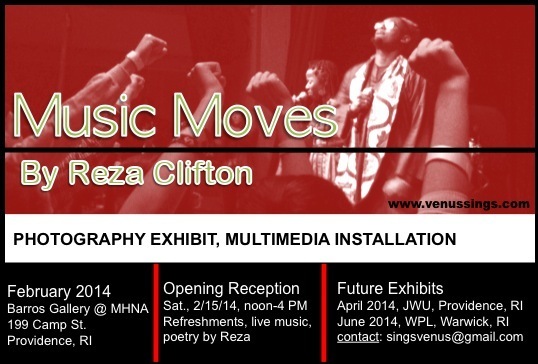 exhibit at URI Providence Campus and on the second image to read the extended #musicmovesreza @ Race Matters! release. Click on the thumbnails to the right to read previous press releases about Music Moves. Follow the project on social media through the hashtag #musicmovesreza or on www.VenusSings.com. 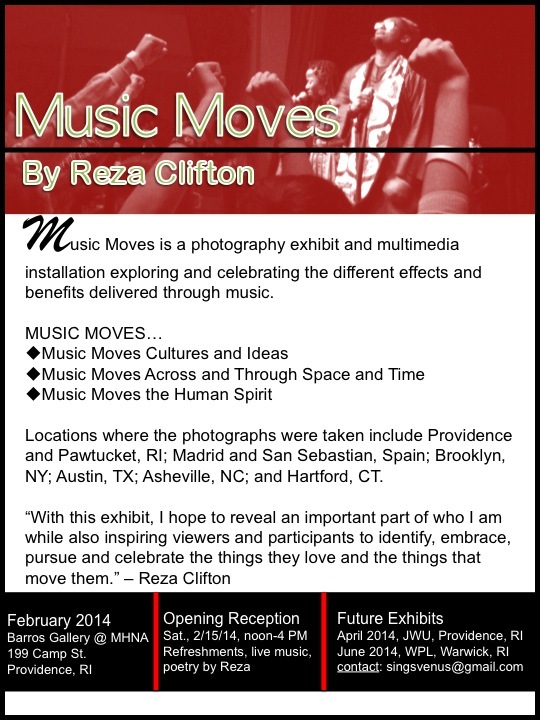 Music Moves is a photography exhibit and multimedia installation by Reza C. Clifton exploring and celebrating the different effects and benefits delivered through music. Locations where the photographs were taken include Providence and Pawtucket, RI; Madrid and San Sebastian, Spain; Brooklyn, NY; Austin, TX; Asheville, NC; and Hartford, CT.
Have you had a chance to check out the new #MusicMovesReza photography exhibit? 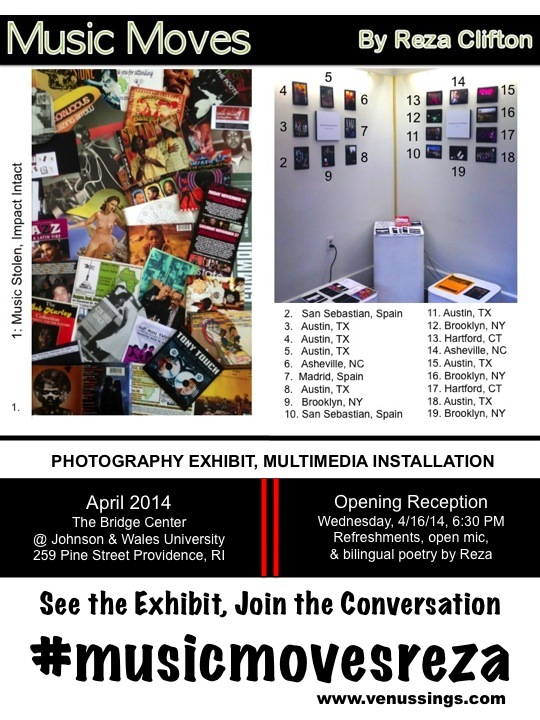 Save the date for the next reception and show: Wednesday, April 16, 2014, 6:30 PM. PROVIDENCE, RI – As technology evolves, so do the ways in which we hear and enjoy music and the musicians we follow. Still, there is something to be said for the live performance; for that interaction between the performer(s) and the audience; for those opportunities to see or hear something that will never be replicated again; for those moments when you realize how many of your other senses are being activated. On February 15, from noon to 4 PM, Clifton will join peers, friends, family and community members for a reception and presentation of the gallery’s February artists. Clifton will also perform some of her poetry on the 15th – alongside Cedric Josey, a New Bedford, MA-based singer songwriter who will play original selections and accompany Clifton. 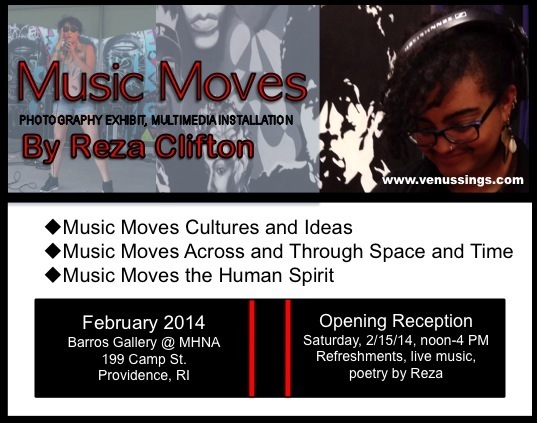 For more information about the exhibit or to contact Reza Clifton, email singsvenus@gmail.com or call 401-217-9680.